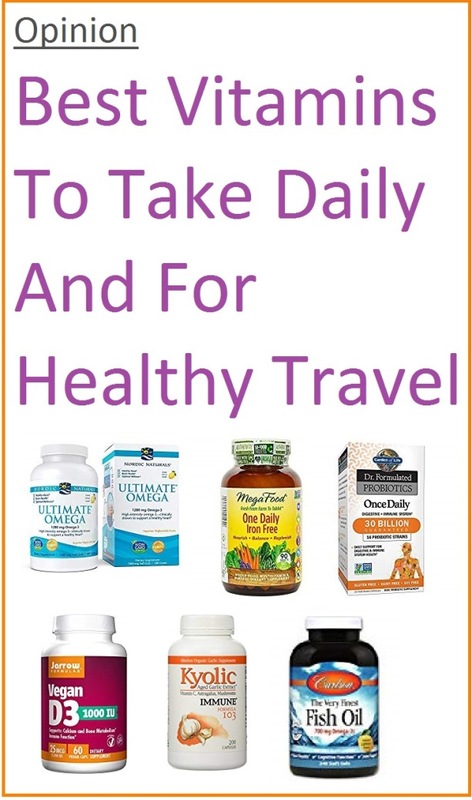 What are the best vitamins to take on a daily basis and for healthy travel? As one who travels a lot — and with varied work hours writing stories — I don’t have time to get sick. The basics of eating fruits and vegetables along, with lean meats and the right fats, go a long way in helping that cause, but the right vitamin and health supplements can lend a huge boost, also. A good multi can cover any nutritional gaps. Aim for one that meets 100% of the daily value of each vitamin and mineral, although calcium and magnesium might have to be taken separately. If you consume dairy, nuts and greens, you won’t need a calcium/magnesium supplement, though, in my opinion. Try to stick with a brand that best resembles whole food instead of taking isolated nutrients. Garden of Life mens and womens formulas and Megafood One Daily do a good job at this, but try to get them at a deep discount at amazon, Vitamin Shoppe or another discount retailer. I have seen the Garden of Life brand, lately, also, at Walmart and CVS. Critical for the immune system, inflammation, eyes, heart and brain. More DHA supports the eyes, brain and heart, while more EPA targets inflammation. Try to take a fish oil supplement that is balanced with both omega 3s. Nordic Naturals and Carlson’s make great fish oil supplements. 2000 mg. is optimal, although be sure to check with your doctor first — especially if your blood is thin or you bleed easy. Some say up to 75% of your immune system is in your gut, so probiotics seem like a good way to address that. You want more good bacteria in your gut than bad. Do probiotics work? The jury is still out, but I believe they do based on personal experience. I get sick much less and my digestion has become so much better. There are so many brands out there, however, with unproven strains of good bacteria. I would go with one that has strains that have been studied in a modest amount like 15 billion. Reputable brands with studied, researched strains include Renew Life, Jarrow Formula and Garden of Life Dr. Recommended. Get your levels checked by a doctor first and get his/her recommendation on what amount you should take. If he/she doesn’t know, find another doctor! D3 is the form that best absorbs and is safest. I take 3000 I.U.s a day. Good brands include Garden of Life, as well as Jarrow. The cheaper ones can work, too, but beware of “other ingredients.” If you see hard to pronounce ingredients or something questionable on any supplement, stay clear. In the long run, it might do more harm than good. The cheaper brands are often notorious for dubious “other ingredients” and go against the very reason we should be taking supplements. Also Non GMO brands might be a good idea, too. Brands like Garden of Life, Megafood and New Chapter are GMO free. For the record, I also take Kyolic Immune Formula 103 during the cold season. It contains aged odorless garlic, vitamin C and herbs that all help balance the immune system. I think it is a brilliantly conceived supplement that really works. The studies about the benefits of aged garlic are really impressive (very good for the heart); nice that this one is odorless! Lastly, but very important: Treat supplements as just that. They are supplements, never meant to replace whole foods. The best vitamins at the right dose, however, can offer some great benefits, in my opinion. I used to have horrible allergies until 1994 when a naturopath recommended two supplements to take. I did just that, and have been clear of any bad allergies for the past 24 years. What are the best vitamins, in your opinion? Please comment below. Good luck and be healthy in 2019 and beyond! Editor’s note:The opinions stated in this article have not been evaluated by the Food and Drug Administration. These products are not intended to diagnose, treat, cure or prevent any disease.